There are two possible reactions upon eyeing our star rating for the WF-1000Xs: either you may see it as Sony having simply designed a pair of great-sounding headphones, or you may be experiencing mild shock at the fact we regard a pair of true wireless, noise-cancelling in-ears worthy of being awarded five stars. And when we say true wireless, this time we mean it. Whereas the earpieces for many wireless in-ear headphones are tethered to one another by a cable running around the listener’s neck, the WF-1000X are connected only by a Bluetooth signal floating imperceptibly in the ether. It’s all rather Tomorrow’s World, with the Sonys’ sci-fi design compounded by a charging hub somewhat reminiscent of that chamber we were told Michael Jackson used to sleep in. Said chamber is charged via USB, and is compact enough that you could carry it around with you and extend your headphones’ claimed nine-hour battery life (with noise-cancelling enabled) without a fixed power source. Clip them in, they begin to charge; take them out and they switch on automatically. You’ll find all this in the box, of course, as well as a USB cable, six alternative pairs of buds – three colour-coded sizes each in rubber and foam – and replacement ‘arc supporters’ included by Sony for a more secure fitting. As for the physical make-up, Sony has managed to cram a lot into these diminutive in-ears: a 6mm dynamic driver and mic are entombed alongside each piece’s battery and circuit. The mic is more than just a tool for answering phone calls, it aids in the WF-1000Xs’ Google Now and Siri compatibility: yet more ways to unnerve fellow passengers by talking to yourself on the tube. Each piece has space for only one button, so you’ll need to become fluent in a kind of Morse Code to access all the WF-1000Xs’ features. However, it’s simple to grasp, even just via a little fumbling, and even the most technologically stunted should have little trouble. Effectively, via a series of long presses and single, double and triple clicks, the left is used to control noise-cancelling and the right playback, phone calls and voice controls. The only thing you can't control with them is volume. 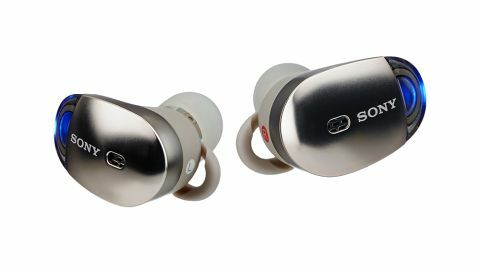 Unlike Sony's WH-1000XM2 over-ear noise-cancellers, the in-ears don't use the company's Noise Cancelling Optimizer which pings out a test tone to sweep your ears and the surrounding environment. You simply have noise-cancelling and Ambient Sound modes that can either be turned on or off. What they do share with the over-ear version is the Headphones Connect app for Android and iOS. Here you can engage the Smart Auto-settings where the headphones use your phone's gyroscope to work out whether you're stood still, or in motion and adjust the level of noise-cancelling and ambient noise allowed through. It's a neat-looking app that adds an extra touch of usability. The first of these controls you’ll need to master, though, is a seven-second push to activate Bluetooth pairing. With that, we’re connected and begin playing Flying Lotus’s supreme You’re Dead! If you’ve previously owned a pair of Sony premium headphones, you probably won’t be surprised by the WF-1000Xs’ impressive levels of detail and clarity. The noise cancelling works well enough for a pair of in-ears but, as you'd expect, it can't quite match the quality of its over-ear brethren. Brushed snares, overdriven guitars and sprawling saxophone lines are offered great insight and a decent amount of texture. There isn’t a huge amount of space, but it’s still respectable for a pair of wireless in-ears. They have no trouble, either, in keeping up with the album’s darting rhythmic patterns and fluid time signatures; there is a satisfying combination of light- and surefootedness, with enough punch and drive to assure the listener of their control and adept handling. Sony has rarely struggled judging tonal balance when it comes to its headphones, either, but a pair of in-ears that gets that aspect right is always pleasing nonetheless. There’s a decent amount of bass weight to the mix without it becoming too heavy in any attempt to make the WF-1000Xs sound bigger than they are, counterpointed aptly by rich treble and mid-range. Dynamic range, too, is impressive. As well as keeping their finger on the irregular rhythmic pulse of Flying Lotus’s work, the WF-1000Xs refuse to ignore its musicality. As we skip through our library, those dynamics are not shy to dig out the emotion in more vocal-led arrangements either: Ryan Adams’ Prisoner, say, or Patti Smith’s Horses. There is one point that needs mentioning, though. With our first sample pair, we had occasional issues with the channel in the right earpiece cutting out. While that would automatically equate to the loss of at least one star from our rating, this was one of the very first production samples. Given that we’ve had no issues with Sony’s many previous wireless products, we decided to give the company the benefit of the doubt; and that confidence seems not to have been misplaced, having had no subsequent teething problems with samples of the WF-1000Xs we've heard since. We can’t help but recommend the WF-1000Xs to anyone eager for a pair of truly wireless, noise-cancelling in-ears. In the landscape of this particular market, this is the best product we’ve had the pleasure of testing so far.